Salam & hello everyone. Guess what I got? Did you come here from my teaser picture? I bet you wanna know what I got in that beautiful red box don't you? Well, I am pretty excited, yes I am! I just got my hands on this Pitera Essence Set that contains the world best essence ever made to mankind. Yeap, introducing the SK-II Pitera Set that contains the best seller star product, Facial Treatment Essence 75ml, Facial Treatment Clear Lotion 40ml and the Facial Treatment Mask. SK-II is best known for its miracle water that can help to make your skin brighter and clear. I love how this set is packed into such a lovely design box. It look so exclusive and pretty. 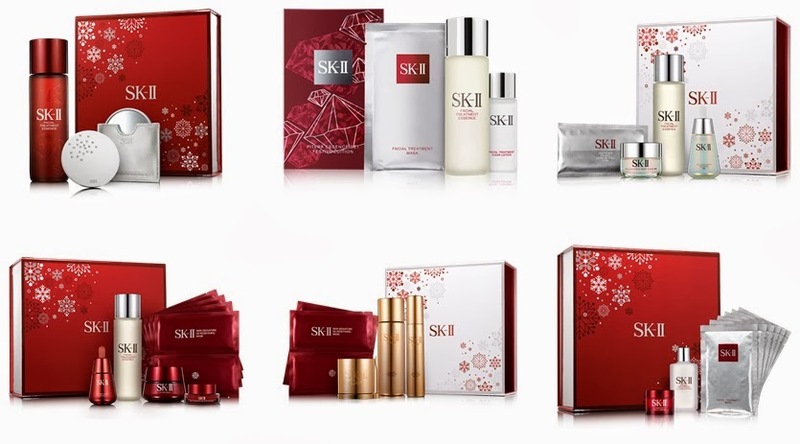 This is a festive set that you can still get in all SK-II counter (while stock last). It is a great set for beginners like me. There are millions of success story to all users around the world using this miracle water. The star product. It is the best seller and I can't wait to use this. It contains 90% Pitera that was discovered 30 years ago. It helps to moderate the skin surface renewal cycle. So your skin can be younger than how you really are. It also claims to be a 14 days result. I am excited! In just 14 days, all 5 elements of your skin such as spots, wrinkles, firmness, texture and radiance will be improved. The suggested 2nd step before the Essences. This toner have a mixture of AHA and Pitera helps to exfoliates dead skin cell and impurities. So even after cleansing, there is still some impurities on your skin. This helps to confirm that your skin is ready for some goodness! The texture of this toner is light and watery for easy penetration on the skin. This goes well with a cotton pad. Can be used both day and night. This set also contains 1 pc of their best seller mask. Made out of 100% cotton that helps to drench and allow all the Pitera goodness to get into your skin. It also said that this is one of the traditional ways the Japanese bride prepares for weddings. They love to soak up the Pitera essence on a cotton and use it as a mask for the bride to be 90 days before their big day! It was all started in 1970's in research of an ingredient to make skin clearer, brighter and and have this translucent natural glow. SK-II discovered that Pitera is the key to all this. They found that the hands of sake brewers were soft and youthful hands. Why? The sake brewers uses their hands to mix the sake ingredients...Pitera in the ingredients is the key. It is the inspiration of the research of the yeast fermentation process. And did you know that they have to gone through a search of 350 stains of yeast to discover the Pitera. The SK-II Pitera contains all the natural Moisturizing Factors (NMF) and also other ingredients such as polysaccharides and proteins that improve the skin functions. A whole good stuff in it! Also the Essences is also a mixture of other goodness of combination such as delicate balance of vitamins, amino acids, minerals and organic acids, and the Natural Moisturising Factors. All of this goodness in one bottle will help to give your skin more youthful. The Pitera Set retails at RM280+. There also other set you can find in stores like above picture. I am looking forward to try this set and come with me with my journey with SK-II starting this month and more on wards. I will go through deeply on this set and review it. Check out the SK-II Pitera Essence and sign up for the SK-II newsletter here. Have you tried SK-II products? What is your thoughts? **Disclaimer - Sponsored. This product(s) were send to me for product review purposes. never tried SK-II coz the price is totally out of my reach, at the moment. maybe dah kerja nanti baru mampu. when i was a cashier at parkson, tahu harga SK-II kalau beli complete set masa tu RM2400. yep, i got to admit that the set worth 4 figure. its ok, i am also eyeing on the whole sets, in sya Allah when we started to get our own paychecks! I'll definitely be looking forward to your review for this one. I've even considering whether to get this or another Treatment Essence from Korean brand. Been using the essence for quite some time. Despite giving me occasional pimple breakouts (n i very rarely hv those), i still hv faith in the product.